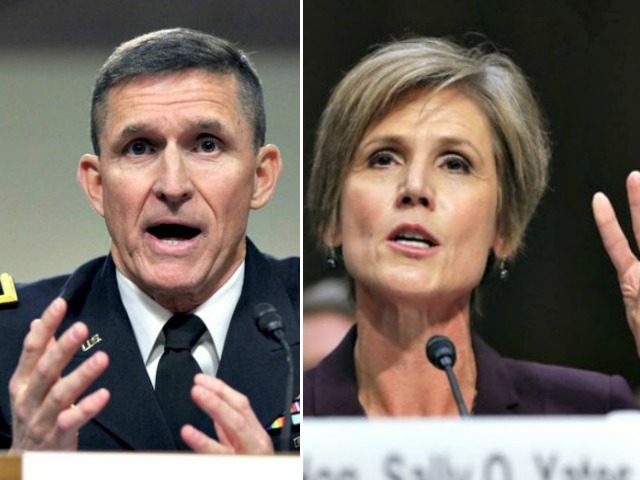 8 May 2017 WASHINGTON, D.C.
Former Deputy Attorney General Sally Yates appeared to agree that former National Security Adviser Michael Flynn was “compromised” by his interactions with Russian government officials. “Lt. Gen. Flynn remained national security advisor for 18 days after you raised the Justice Department’s concern. In your view, during those 18 days, did the risk that Flynn had been or could be compromised diminish at all?” Sen. Diane Feinstein (D-CA) asked Yates after she outlined the information collected and passed to the Trump administration by the Department of Justice, which at that time was under Yates’s authority as Acting Attorney General. “I know we were really concerned about the compromise here and that’s why we were encouraging them to act,” Yates told the Senate Judicial Committee’s Subcommittee on Crime and Terrorism in response. Ms. Yates’s characterization of the events surrounding Flynn’s resignation broadly comports with previous accounts in the media, but this was the first time she had described General Flynn as “compromised.” Most notably, she and her fellow witness, former Director of National Intelligence James Clapper, remained mum about the leaks to the New York Times and Washington Post that turned the matter from an internal intelligence community investigation into a national political scandal. “Was the point that you were trying to make that General Flynn had compromised the security of the United States and possibly the government by what he had done, whatever that was?” Feinstein then asked. Yates further explained that she was concerned Vice President Mike Pence had told the American people things about Flynn’s conversations with Russian Ambassador Sergey Kislyak that were not true, and that she and her colleagues at DOJ felt compelled to relay the information they had contradicting those statements to the White House. “You were worried that General Flynn would be compromised. What did you think would happen if he were and how how do you believe he would have been compromised,” Feinstein asked Yates after questioning Clapper. We had two concerns. Compromise was certainly the number one concern. The Russians can use compromise material and information in a variety of ways, sometimes overtly and sometimes subtly … our concern was that you have a very sensitive position like the National Security Adviser, and you don’t want that person to be in a position where, again, the Russians have leverage over him. But I will also say another motivating factor is that we felt the Vice President was entitled to know that the information he had been given and that he was relaying to the American public wasn’t true. Monday’s hearing was held to discuss the investigation conducted by four U.S. intelligence agencies, and ordered in December by former President Barack Obama, into Russia’s attempts to influence the elections. It was from this investigation that the revelation which lead to National Security Advisor Flynn’s resignation arose.